Aging in place can be a lonely proposition for your parents. You can’t always be there, but a way to help solve this is for them to have a pet. One year-long study found that walking an overweight dog helped both the animals and their owners lose weight. Researchers found that the dogs provided support in similar ways to a human exercise buddy, but with greater consistency and without any negative influence. Public housing residents who walked therapy dogs for up to 20 minutes five days a week lost an average of 14.4 pounds in a year, without changing their diets. A third study found that people who got a dog walked 30 minutes more a week than they did before. Helping you find meaning and joy in life. As you age, you’ll lose things that previously occupied your time and gave your life purpose. You may retire from your career or your children may move far away. Caring for a dog can bring pleasure and help boost your morale, optimism, and sense of self-worth. Choosing to adopt a dog from a shelter, especially an older dog, can add to the sense of fulfillment, knowing that you’ve provided a home to a pet that may otherwise have been euthanized. Staying connected. Maintaining a social network isn’t always easy as you grow older. Retirement, illness, death, and relocation can take away close friends and family members. And making new friends can get harder. 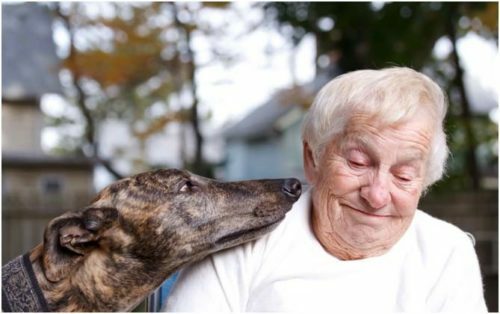 Dogs are a great way for older adults to spark up conversations and meet new people. Boosting vitality. You can overcome many of the physical challenges associated with aging by taking good care of yourself. Dogs, and to a lesser degree cats, encourage playfulness, laughter, and exercise, which can help boost your immune system and increase your energy. As part of the disease, Alzheimer’s patients may exhibit a variety of behavioral problems, many related to an inability to deal with stress. Research at the University of California at Davis concluded that Alzheimer’s patients suffer less stress and have fewer anxious outbursts if there is a dog or cat in the home. Dogs can provide a source of positive, nonverbal communication. The playful interaction and gentle touch from a well-trained, docile dog can help soothe an Alzheimer’s patient and decrease aggressive behavior. 5.0 out of 5 stars Perfect. 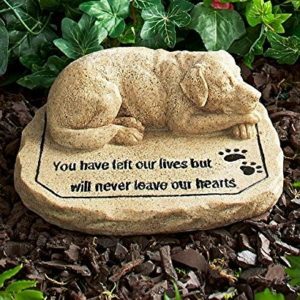 Just what we wanted to memorialize our beloved dog. It is just the right size and a quality design. Order Here (affiliate) I Think You Will Like This Aging in Place Product!